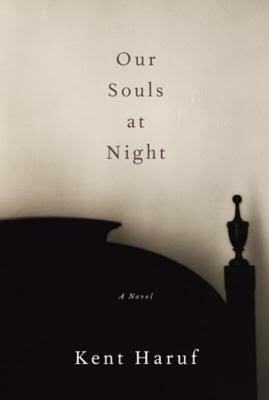 Our Souls at Night by Kent Haruf came to my attention after my mother discovered it, read it, and liked it. This is Haruf’s last novel. Sadly, he passed away in 2014. This is a bittersweet love story about a woman in her seventies named Addie and the relationship which develops after she asks her neighbor Louis, a widower, if he will consider spending his nights at her home. Addie, a widow, is lonely and in need of a man to speak with in the dark at the end of the day. As their unlikely relationship blossoms, many intimate life secrets are revealed making this a touching story. Despite the wagging of tongues in their small Colorado town, all goes well until the entrance of Addie’s grandson who experiences a loneliness of his own. This is a lovely final novel by Haruf and one I could relate to on a personal level. The author’s vivid descriptions are ones which made me long to be in the mountains. Thank you Mom for the recommendation! This entry was posted in Uncategorized and tagged Books, Colorado, gossip, kent haruf, loneliness, our souls at night, widowers, widows. Bookmark the permalink.